I’m currently completing my MSc under the supervision of Jennifer Baltzer in the biology department. After the second year of my undergrad (at the University of Ottawa), I completed a field course run by Baltzer in Yellowknife, Northwest Territories (NWT). During those two weeks, I fell in love with the north and the research opportunities there. I thought it would be really great to get involved with the research that Laurier has going on in the Northwest Territories. The next summer, I was a research assistant at the Scotty Creek Research Station. I completed some research there for my undergraduate thesis project and the next summer began fieldwork for my masters. 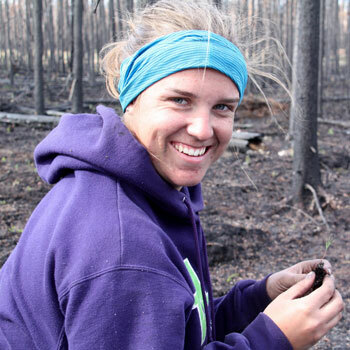 I am studying post-fire successional dynamics in the boreal forest of the NWT. Wildfire is a natural process in the boreal and so dominant conifers (jack pine and black spruce) have adapted to reproduce with fire. These trees have serotinous and semi-serotinous cones which open with the heat of the fire to disperse seeds for germination. In 2014, the NWT experienced its largest fire season on record, with a total of 3.4 million hectares of forest burning. With a changing climate, we expect to see larger, more frequent, and more severe fire years. In Alaska, black spruce dominated forests that have experienced severe fires have shown a shift towards forests dominated by deciduous species. This change in dominance has implications for the future wildfire regime, forest albedo, and wildlife habitat. We’re interested to see how the boreal forest of the NWT is responding to extreme fires and whether this same shift is happening in the NWT. The NWT is boreal is unique in its composition in northwestern North America due to the presence of jack pine which is a fast-growing competitive conifer. Evidence of how jack pine interacts with black spruce post-fire is limited to the Quebec and Alberta boreal forests since jack pine is not present in Alaska or the Yukon. In our research, we’re seeing a shift away from black spruce dominated and black spruce-jack pine mixed forests and a shift towards jack pine-dominated forests. This suggests that jack pine can establish in much higher densities than black spruce, at least following such a widespread and severe fire year. Future changes to the fire regime will determine how the successional trajectories of these forests play out and whether jack pine becomes an ever more prominent species in these boreal forests. I have spent four summers doing research in the NWT as both an undergraduate and graduate student. Throughout this time, I have gotten to meet lots of great people and have some really cool experiences. I have seen the northern lights, travelled to small, remote communities, been on countless boats, helicopters, and floatplanes, seen lots of interesting wildlife and weather, and encountered more mosquitos than I ever thought was possible. I’ve had so many unique opportunities throughout my research time at Laurier and have a lot of memories that I am sure I will never forget. After I complete my masters, I am beginning my PhD in geography at Memorial University of Newfoundland under the supervision of Carissa Brown. I will be investigating the role of tundra fires in the northward expansion of the treeline. I am excited to continue my research in fire ecology and to broaden my fire knowledge across two biomes: the boreal and the tundra. Reid has now completed her studies at Laurier.